Auctiva's FREE Scrolling Gallery will enhance your listings. 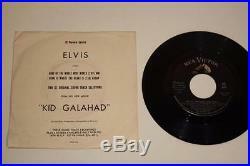 NM Elvis Presley "Kid Gallahad" 7 SP-45-118 RCA PROMO DJ Preview Special w/PS. Very rare US pressing in stunning condition. Sleeve has NO splits or writing, just some ring wear and record impression with some corner bending. All items visually graded unless noted. View My Other Items For Sale. See Below for Grading Scale. International Buyers - Please Note. We do not mark merchandise values below value or mark items as "gifts" - US and International government regulations prohibit such behavior. I try to work out all issues so please contact me. I strive for 100% Feedback and DSR's. Here's a guideline for how I grade records. Not all records will fit "exactly" into a certain grade, and one should assume a certain amount of tolerances within each grade. Assume grading to be "visual" unless noted. I grade under a powerful 100 watt bulb. I use pluses and minuses to help indicate more or less issues in a certain grade. I use parentheses to mean "maybe" i. VG(+) means it may be a little closer to a plus. M : new, un-played, perfect, usually sealed. NM: like new but possibly carefully played a limited amount of times. Should play near perfect with almost no noise or imperfections. May show very faint imperfections from paper scuffs or tiny needle marks. EX : as above with a few light needle marks, or a few light surface scuffs, and/or lightly audible marks. A very nice used record. Between VG and EX, no feelable scratches and will definitely play through with no skips or jumps. VG : still showing gloss but lots of small scratches and scuffs or some light groove wear. A used/played record that should still play through without skips, but will have light surface noise throughout, pops, ticks, and maybe some light distortion/sibilance. I do not consider VG to be a complete junk grade. VG- to G : any record in less than VG condition that I feel is still worth offering due to it? No wear, square flat corners, solid seams, spine etc. NM : overall appearance of front and back near perfect but may have a very small problem such as a small corner ding/couple tiny spine chips, but nothing noticeable without close inspection. EX : as above, nice "un-handled" feel, but may have more spine wear, a bent or dinged corner or two, very light ring wear, but rarely any splits or tears. Between VG and EX (usually closer to an EX grade), NO major seem splits over a an inch or two, No visible water damage. Edge chipping and smaller splits possible, ring wear, and small name or writing possible but should be noted. VG: still has a nice overall appearance, but may have the following defects: seam splits, spine splits, small tears, ring wear, writing, stains, water damage, stickers etc. VG- to G : getting ugly, but for some reason still worth offering. The item "NM Elvis Presley Kid Gallahad 7 SP-45-118 RCA PROMO DJ Preview Special withPS" is in sale since Sunday, February 07, 2016. This item is in the category "Music\Records". The seller is "rock-vitamins" and is located in Woodland Hills, California. This item can be shipped worldwide.